This accounting fraud is protected. The public is not. The fraudster's signature cover is to divide and conquer the family they victimize. The public needs a free press to show how they do it. It is irresponsible to keep this concealed. The signature cover of this accounting fraud is to use a trusting family member to unwittingly divide, destabilize, and disempower the family they victimize. It is the perfect cover. They have irreversibly destroyed our family to cover up their accounting. It's like burning down a home to cover up a robbery. It's like going for the jugular under the guise of a fiduciary relationship. What could they not frame me with when they can frame me with this Complaint? On March 30, 2012, after nineteen (19) years of trying to go through traditional channels to expose the accounting for our Mother's Estate, I tried to bring attention to it by posting http://www.canweconnectthedots.com . About five (5) weeks after I posted http://www.canweconnectthedots.com , my 77 acres in in Highland County, Virginia, is taken over using an illegal lien. The lien is so secret those in control won't identify the property it is placed against. It's been five (5) years now. About eight (8) weeks after I posted http://www.canweconnectthedots.com , the process of taking over my livelyhood, the Trust property of 15 acres, in Fairfax County, Virginia, is began. the property described in the Deed at http://www.book8307page1446deed.com using this Complant. The accounting for our Mother's Estate at bk467p191 remains concealed. Our Mother did not want money to disappear from her estate or her family torn apart to cover it up. The only way to get to the truth is to remove the secrecy, expose the trails, follow the trails, and recognize the trails. 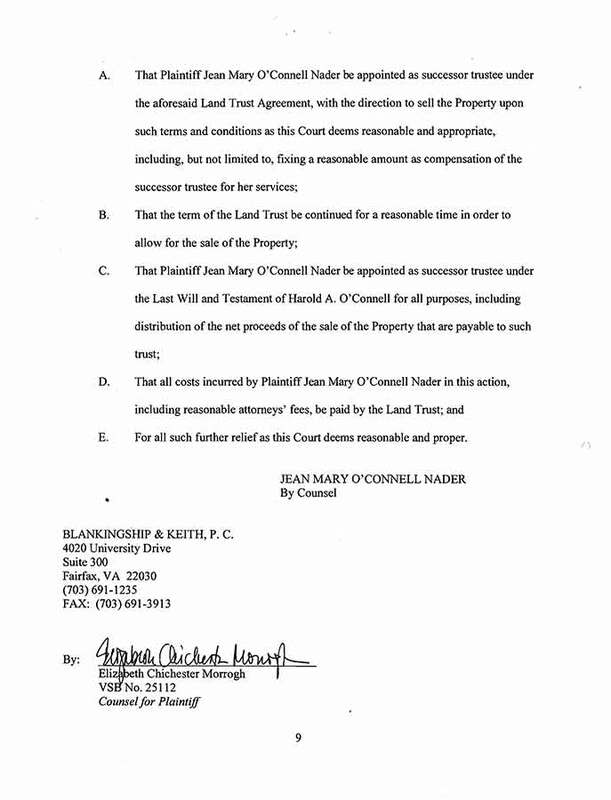 COMES NOW the Plaintiff, Jean Mary O'Connell Nader, by counsel, and brings this action pursuant to § 26-48 and 55-547.06 of the Code of Virginia (1950, as amended) for the removal and appointment of a trustee, and in support thereof states the following. 1. 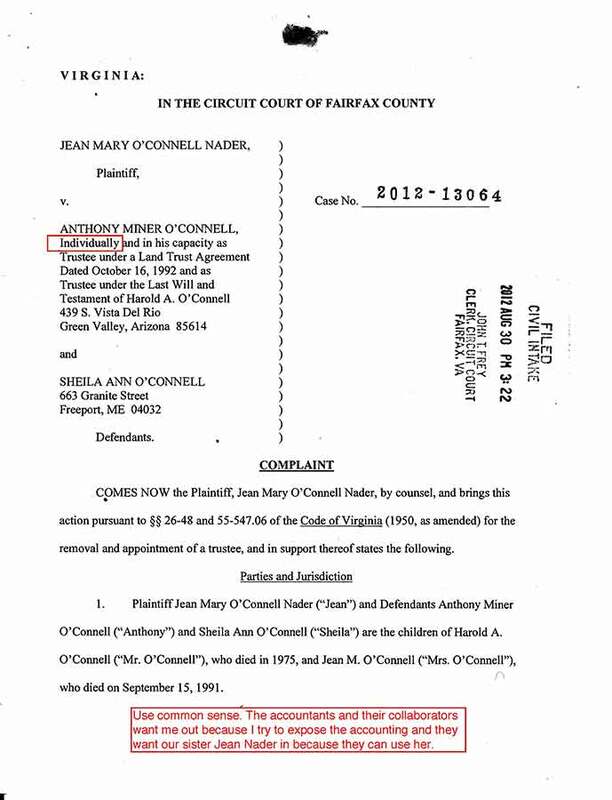 Plaintiff Jean Mary O’Connell Nader ("Jean") and *Defendants Anthony Miner O’Connell ("Anthony") and Sheila Ann O'Connell ("Sheila") are the children of Harold A. O’Connell ("Mr. O’Connell"), who died in 1975, and Jean M. O'Connell ("Mrs. O'Connell"), who died on September 15, 1991. 2. 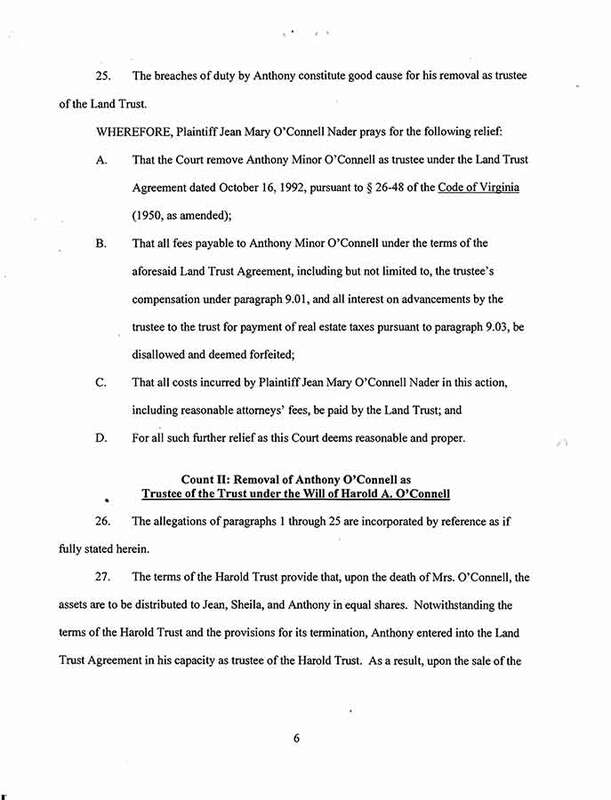 The trusts that are the subject of this action are: (a) the trust created under the Last Will and Testament of Harold A. O'Connell dated April 11, 1974, and admitted to probate in this Court on June 18, 1975; and (b) a Land Trust Agreement dated October 16, 1992, which was recorded among the land records of this Court in Deed Book 8845 at Page 1449. 3. Jean, Sheila, and Anthony are the beneficiaries of both of the trusts and, therefore, are the parties interested in this proceeding. 4. During their lifetimes, Mr. and Mrs. O'Connell owned as tenants in common a parcel of unimproved real estate identified by Tax Map No. 0904-0 1-00 17 and located near the Franconia area of Fairfax County, Virginia and consisting of approximately 15 acres (the "Property"). 5. 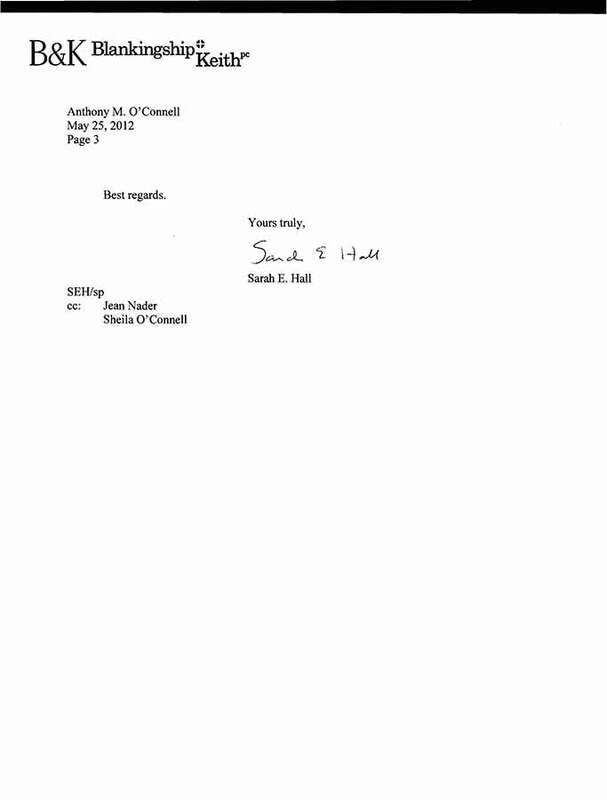 After his death in 1975, a 46.0994% interest in the Property deriving from Mr. O'Connell's original 50% share was transferred to a trust created under his Last Will and Testament (the "Harold Trust"), of which Anthony serves as trustee. A copy of the Last Will and Testament of Harold A. O'Connell is attached hereto as Exhibit A. 6. Mrs. O'Connell held a life interest in the Harold Trust and, upon her death in 1991, the trust assets were to be distributed in equal shares to Jean, Sheila, and Anthony as remainder beneficiaries. Although other assets of the Harold Trust were distributed to the remainder beneficiaries, the trust's 46.0994% interest in the Property has never been distributed to Jean, Sheila, and Anthony in accordance with the terms of the Harold Trust. 7. 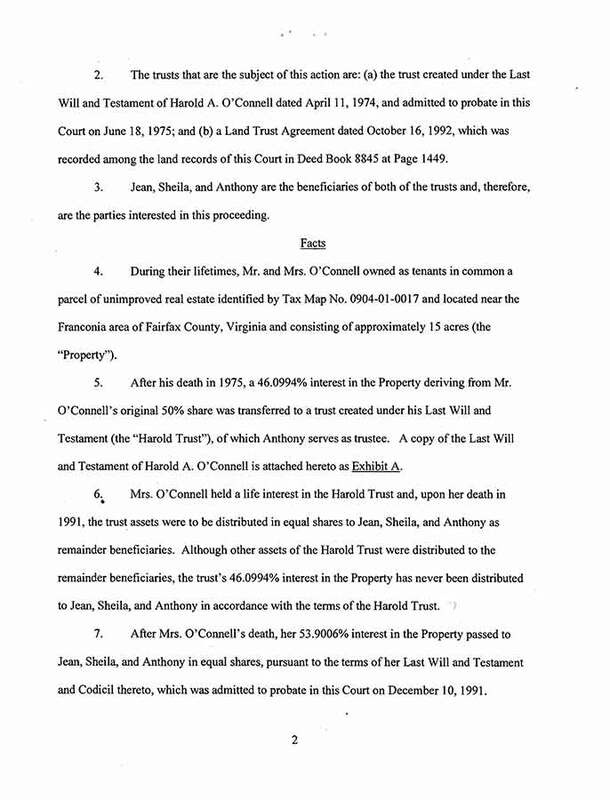 After Mrs. O'Connell's death, her 53.9006% interest in the Property passed to Jean, Sheila, and Anthony in equal shares, pursuant to the terms of her Last Will and Testament and Codicil thereto, which was admitted to probate in this Court on December 10, 1991. 8. Thus, after Mrs. O'Connell's death, Jean, Sheila, and Anthony each owned a 17.96687% interest in the Property, and the Harold Trust continued to own a 49.0994% interest in the Property. 9. By a Land Trust Agreement dated October 16, 1992, Jean, Sheila, and Anthony, individually and in his capacity as trustee of the Harold Trust, created a Land Trust (the "Land Trust"), naming Anthony as initial trustee. A copy of the Land Trust Agreement is attached hereto as Exhibit B and incorporated by reference herein. The Harold Trust, Jean, Sheila, and " Anthony (individually) are the beneficiaries of the Land Trust. 10. The Property was thereafter conveyed by Jean, Sheila, and Anthony, individually and as trustee of the Harold Trust, to Anthony, as trustee of the Land Trust, by a Deed dated October 16,1992 and recorded on October 23,1992 in Deed Book 8307 at Page 1446 among the land records for Fairfax County. If the Property or any part thereof remains in this trust at the expiration of twenty (20) years from date hereof, the Trustee shall promptly sell the Property at a public sale after a reasonable public advertisement and reasonable notice thereof to the Beneficiaries. 12. To date, the Property has not been sold, and the Land Trust is due to expire on October 16,2012. The Trustee will pay the shortfall and shall be reimbursed the principal plus 10% interest per annum. Trustee shall be reimbursed for any outstanding real estate tax shares or other Beneficiary shared expense still owed by any Beneficiary at settlement on the eventual sale of the property. 14. For many years, Jean sent payment to Anthony for her share of the real estate taxes on the Property. Beginning in or about 1999, Anthony refused to accept her checks because they were made payable to "County of Fairfax." Anthony insisted that any checks for the real estate taxes be made payable to him individually, and he has returned or refused to forward Jean's checks to Fairfax County. Under the circumstances, Jean is unwilling to comply with Anthony's demands regarding the tax payments. 15. Anthony is not willing or has determined he is unable to sell the Property due to a mistaken interpretation of events and transactions concerning the Property and, upon information and belief, the administration of his mother's estate. Anthony's position remains intractable, despite court rulings against him, professional advice, and independent evidence. As a result, Anthony is unable to effectively deal with third parties and the other beneficiaries of the Land Trust. 16. In 2007, Anthony received a reasonable offer from a potential buyer to purchase the Property. Upon information and belief, Anthony became convinced of a title defect with the Property that, in his opinion, was an impediment to the sale of the Property. 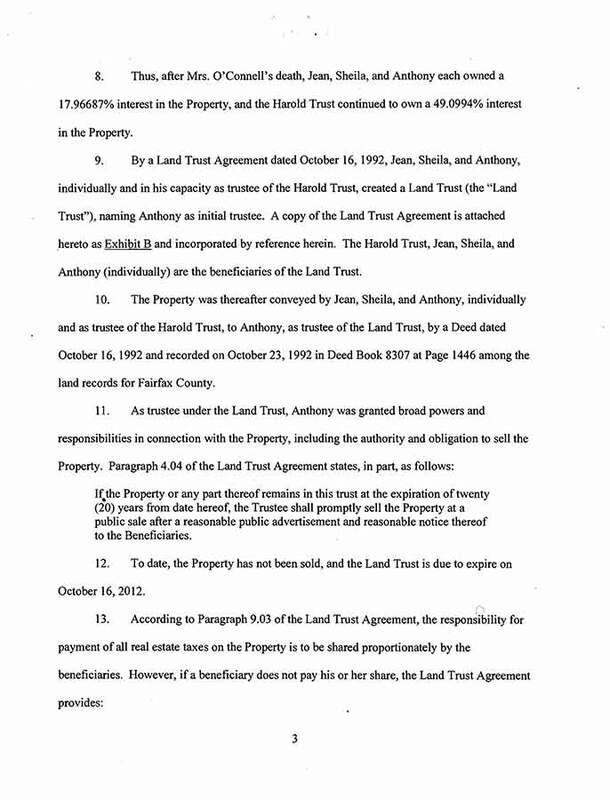 A title commitment issued by Stewart Title and Escrow on April 24,2007, attached hereto as Exhibit C, did not persuade Anthony that he, as the trustee of the Land Trust, had the power to convey the Property. Because of this and other difficulties created by Anthony, the Property was not sold. 17. Since 2007, it appears the only effort put forth by Anthony to sell the Property has been to post it for sale on a website he created, www.alexandriavirginial5acres.com. 18. 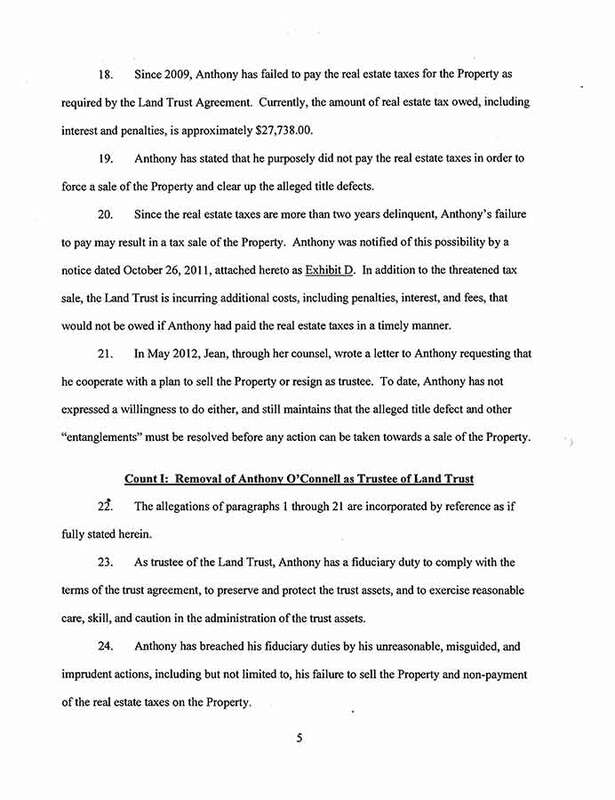 Since 2009, Anthony has failed to pay the real estate taxes for the Property as required by the Land Trust Agreement. Currently, the amount of real estate tax owed, including interest and penalties, is approximately $27,738.00. 19. Anthony has stated that he purposely did not pay the real estate taxes in order to force a sale of the Property and clear up the alleged title defects. 20. Since the real estate taxes are more than two years delinquent, Anthony's failure to pay may result in a tax sale of the Property. 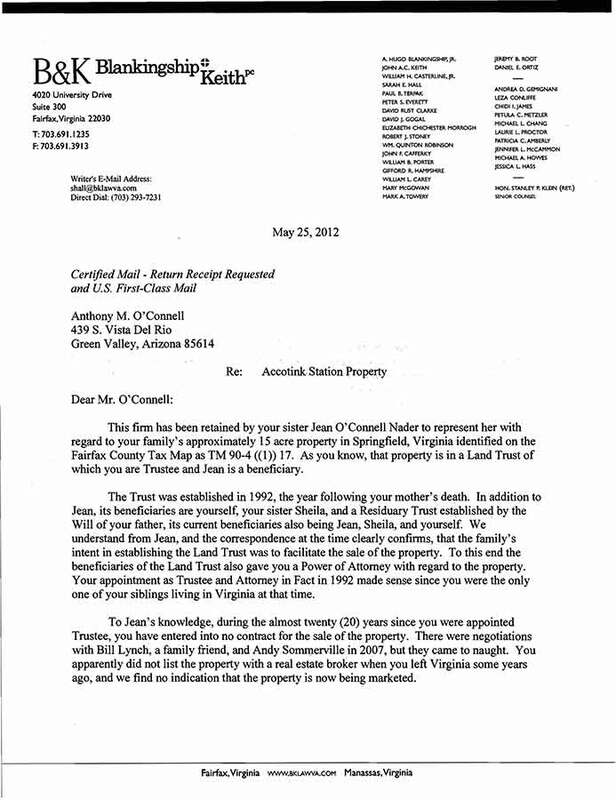 Anthony was notified of this possibility by a notice dated October 26, 201 1, attached hereto as Exhibit D. In addition to the threatened tax sale, the Land Trust is incurring additional costs, including penalties, interest, and fees, that would not be owed if Anthony had paid the real estate taxes in a timely manner. 21. 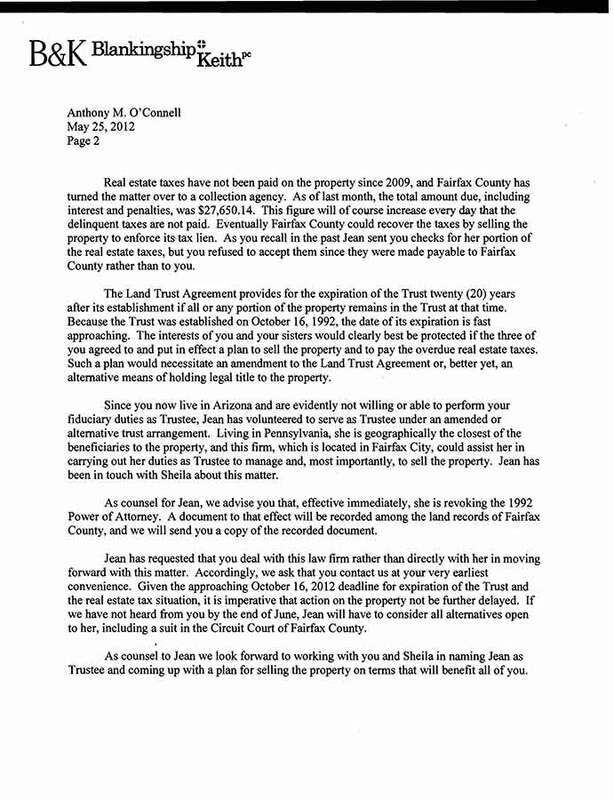 In May 20 12, Jean, through her counsel, wrote a letter to Anthony requesting that he cooperate with a plan to sell the Property or resign as trustee. To date, Anthony has not expressed a willingness to do either, and still maintains that the alleged title defect and other "entanglements" must be resolved before any action can be taken towards a sale of the Property. 22: The allegations of paragraphs 1 through 21 are incorporated by reference as if fully stated herein. 23. As trustee of the Land Trust, Anthony has a fiduciary duty to comply with the terms of the trust agreement, to preserve and protect the trust assets, and to exercise reasonable care, skill, and caution in the administration of the trust assets. 24. Anthony has breached his fiduciary duties by his unreasonable, misguided, and imprudent actions, including but not limited to, his failure to sell the Property and non-payment of the real estate taxes on the Property. 25. The breaches of duty by Anthony constitute good cause for his removal as trustee of the Land Trust. D. For all such further relief as this Court deems reasonable and proper. 26. The allegations of paragraphs 1 through 25 are incorporated by reference as if fully stated herein. 27. The terms of the Harold Trust provide that, upon the death of Mrs. O'Connell, the assets are to be distributed to Jean, Sheila, and Anthony in equal shares. Not withstanding the terms of the Harold Trust and the provisions for its termination, Anthony entered into the Land Trust Agreement in his capacity as trustee of the Harold Trust. As a result, upon the sale of the Property, Anthony can exercise greater control over the Harold Trust's share of the sale proceeds than if the parties held their beneficial interests in their individual capacities. 28, Other than its status as beneficiary of the Land Trust, there is no reason for the continuation of the Harold Trust. 29. On August 8, 2000, an Eleventh Account for the Harold Trust was approved by the Commissioner of Accounts for the Circuit Court of Fairfax County and determined to be a final account. 30. Anthony repeatedly and unsuccessfully challenged the Commissioner's determination and requested, inter alia, that the Court and the Commissioner of Accounts investigate a debt of $659.97 that he alleged was owed to the Harold Trust by Mrs. O'Connell's estate. In these proceedings, the Commissioner stated, and the court agreed, that there was no evidence to support Anthony's claims that a debt existed and, if so, that it was an asset of the Harold Trust. 31. 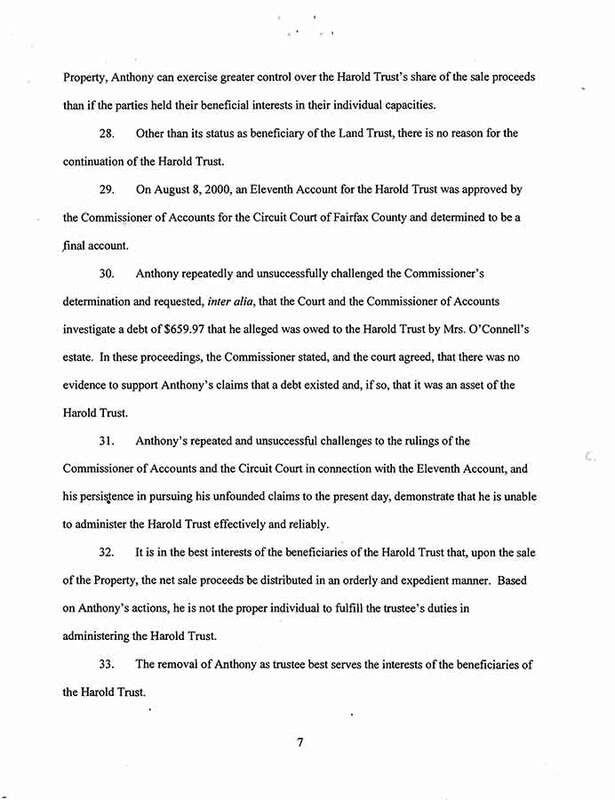 Anthony's repeated and unsuccessful challenges to the rulings of the Commissioner of Accounts and the Circuit Court in connection with the Eleventh Account, and his persistence in pursuing his unfounded claims to the present day, demonstrate that he is unable to administer the Harold Trust effectively and reliably. 32. It is in the best interests of the beneficiaries of the Harold Trust that, upon the sale of the Property, the net sale proceeds be distributed in an orderly and expedient manner. Based on Anthony's actions, he is not the proper individual to fulfill the trustee's duties in administering the Harold Trust. 33. The removal of Anthony as trustee best serves the interests of the beneficiaries of the Harold Trust. C. For all such further relief as this Court deems reasonable and proper. 34. The allegations of paragraphs 1 through 33 are incorporated by reference as if fully stated herein. 35. Jean is a proper person to serve as trustee of the Land Trust in order to sell the Property on behalf of the beneficiaries of the Land Trust, and she is willing and able to serve in such capacity. 36. The best interests of the beneficiaries would be served if the Land Trust is continued for a sufficient period of time to allow the successor trustee to sell the Property, rather than allowing the Land Trust to terminate on the date specified in the Land Trust Agreement. Each of the individual beneficiaries of the Land Trust is age 70 or above, and it would be prudent to sell the Property during their lifetimes, if possible, rather than leaving the matter for the next generation to resolve. 37. Jean is a proper person to serve as trustee of the trust created under the Last Will and Testament of Harold A. O'Connell, and she is willing and able to serve in such capacity. E. For all such further relief as this Court deems reasonable and proper. 4. During their lifetimes, Mr. and Mrs. O'Connell owned as *tenants in common a parcel of unimproved real estate identified by Tax Map No. 0904-0 1-00 17 and located near the Franconia area of Fairfax County, Virginia and consisting of approximately 15 acres (the "Property"). 5. After his death in 1975, a 46.0994% interest in the Property deriving fiom Mr, O'Connell's original 50% share was transferred to a trust created under his Last Will and Testament (the "Harold Trust"), of which Anthony serves as trustee. A copy of the Last Will and Testament of Harold A. O'Connell is attached hereto as Exhibit A. 9. By a Land Trust Agreement dated October 16, 1992, Jean, Sheila, and Anthony, individually and in his capacity as trustee of the Harold Trust, created a Land Trust (the "Land Trust"), naming Anthony as initial trustee. A copy of the Land Trust Agreement is attached hereto as Exhibit B and incorporated by reference herein. The Harold Trust, Jean, Sheila, and Anthony (individually) are the beneficiaries of the Land Trust. 13. According to Paragraph 9.03 of the Land Trust Agreement, the responsibility for payment of all real estate taxes on the Property is to be shared proportionately by the beneficiaries. However, if a beneficiary does not pay his or her share, the Land Trust Agreement provides: The Trustee will pay the shortfall and shall be reimbursed the principal plus 10% interest per annum. Trustee shall be reimbursed for any outstanding real estate tax shares or other Beneficiary shared expense still owed by any Beneficiary at settlement on the eventual sale of the property. taxes on the Property. Beginning in or about 1999, Anthony refused to accept her checks because they were made payable to "County of Fairfax." Anthony insisted that any checks for the real estat'k taxes be made payable to him individually, and he has returned or refused to forward Jean's checks to Fairfax County. Under the circumstances, Jean is unwilling to comply with Anthony's demands regarding the tax payments. 18. 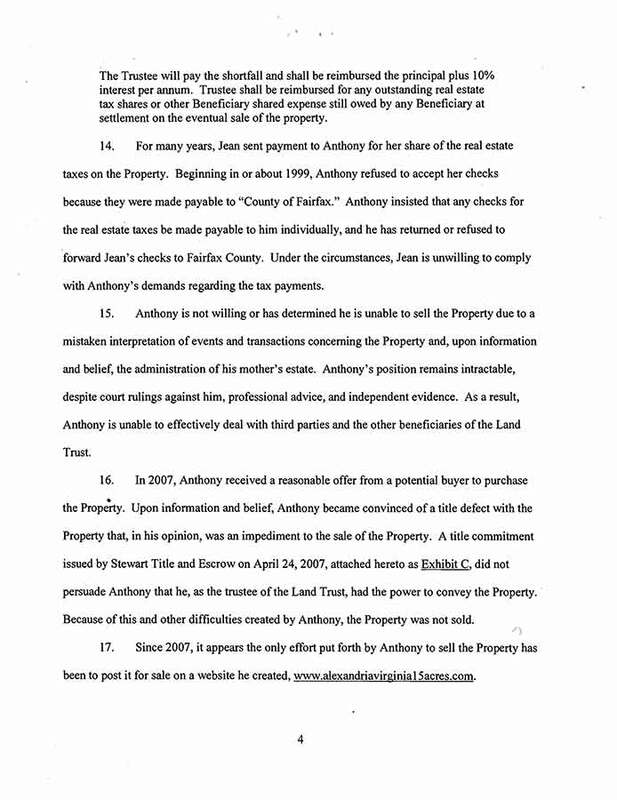 Since 2009, Anthony has failed to pay the real estate taxes for the Property as required by the Lhd Trust Agreement. Currently, the amount of real estate tax owed, including interest and penalties, is approximately $27,738.00. 27. The terms of the Harold Trust provide that, upon the death of Mrs. O'Connell, the assets are to be distributed to Jean, Sheila, and Anthony in equal shares. Notwithstanding the terms of the Harold Trust and the provisions for its termination, Anthony entered into the Land Trust Agreement in his capacity as trustee of the Harold Trust. As a result, upon the sale of the Property, Anthony can exercise greater control over the Harold Trust's share of the sale proceeds than if the parties held their beneficial interests in their individual capacities. 29. On August 8,2000, an Eleventh Account for the Harold Trust was approved by the Commissioner of Accounts for the Circuit Court of Fairfax County and determined to be a final account. 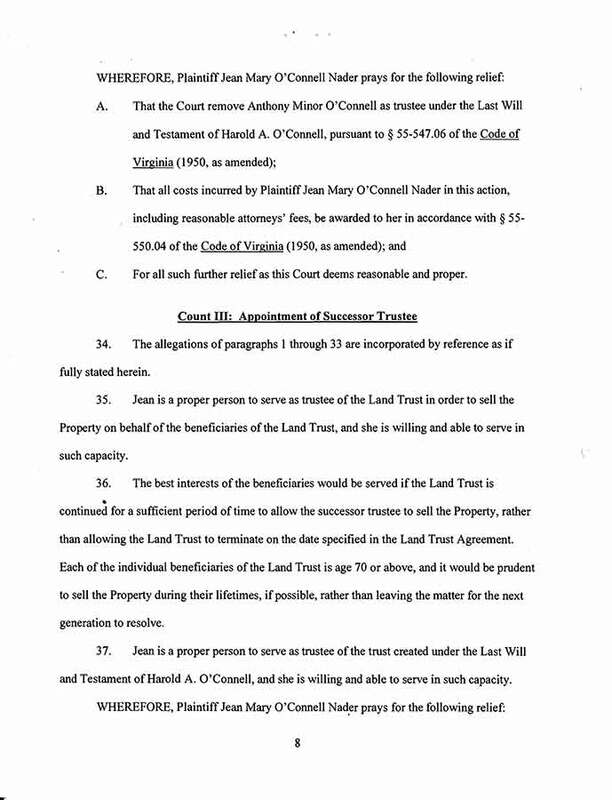 D. That all costs incurred by Plaintiff Jean Mary O'Connell Nader in this action, including reasonable attorneys' fees, be paid by the Land Trust; and E. For all such further relief as this Court deems reasonable and proper.